ATLANTA, GA - APRIL 28: Forward Markieff Morris #5 of the Washington Wizards celebrates during Game Six of the Eastern Conference Quarterfinals against the Atlanta Hawks at Philips Arena on April 28, 2017 in Atlanta, Georgia. John Wall and Bradley Beal are the top scorers and players for the Washington Wizards. When it comes to headline-generating quotes – along with in-game toughness -- nobody is doing more than Markieff “The Enforcer” Morris. The key during the Wizards’ playoff run is Washington’s power forward isn’t just talking the talk, but walking the walk. The numerous lines dropped by Morris over the course of the season, including those not safe for work (warning: graphic content), could fill a news segment and kill at comedy roasts, at least if filled by NBA minds. We’re not talking ha-ha, but cutting jabs at times laced with straight up defiance. The edge is real and omnipresent yet never forced. Morris rarely cracks a smile behind his prominent beard, yet is approachable. His deep voice rarely spikes around reporters, but it’s clear who is in command. 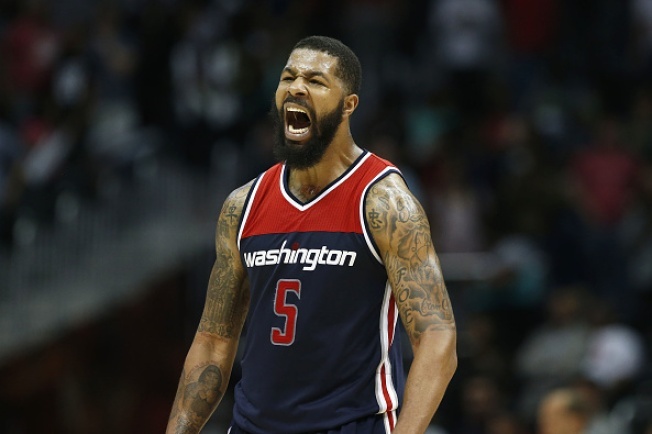 • When Atlanta Hawks star Paul Millsap suggested the Wizards defense was akin to Mixed Martial Arts maneuvers, Morris responded, “Just see where he's at now. I guess if that's MMA, then what we do next might be double MMA." Morris later called Millsap a “crybaby” before the Wizards dispatched the Hawks in round one. • Before the team flew to Boston for Wednesday’s Game 5 (8:00 p.m.), Morris was reminded of a Bleacher Report article earlier in the season inexplicably didn’t rank him among the NBA’s top 30 power forwards. “Whoever those guys who wrote that are [expletive], don’t know anything about basketball and never watch basketball in your life if you don’t rank me in the top 30,” Morris stated. What bothers Washington is when the multi-faceted Morris isn’t on the court because of foul trouble or injury. His basic statistics – 11.4 points, 5.7 rebounds, 1.4 blocks – don’t fully convey the 6-foot-10 forward’s importance. One key advanced number does. Net rating expresses a team's point differential per 100 possessions when a player is on court. During the playoffs, four of the top five spots are occupied by members of the Golden State Warriors, otherwise known as the odds-on-favorite for the 2017 NBA title. Morris (17.9) is the interloper, one slot ahead of fifth place Kevin Durant. Morris has the gumption to tangle with bigger bodies inside and the agility to guard shooters at the 3-point arc. On offense, the NBA twin – his brother plays for the Detroit Pistons -- flashes his own deep touch at times along with a deft passing touch. KG is Kevin Garnett, one of the NBA’s all-time great power forwards and trash talkers. Morris certainly emulates the future Hall of Famer’s no-backing-down demeanor. Good. Washington needs to win at least one of the remaining two games in Boston in order to reach the Eastern Conference finals. Problem: Washington is winless in four games at Boston this season. The Wizards are hot entering Game 5, but winning this series defines rough and tumble. Good thing the Wizards have their enforcer.